Metro Phoenix home prices were up 8% in September 2016 over September 2015. Single family detached home prices were up 9%. 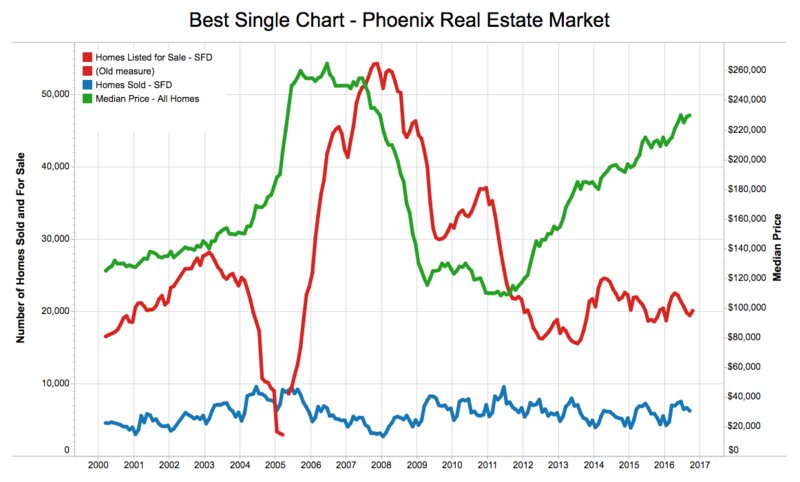 Last year I really didn’t have a good feel for what 2016 would be like for Phoenix home prices but it turned out to be a good year… well, at least for homeowners. Interest Rates. At the end of last year, all the talk was that the Fed would increase interest rates 2 to 4 times in 2016. But, it turns out, the Fed hasn’t increased the Federal Funds rate once this year and mortgage rates actually fell! Inventory and New Listings Hitting the Market. Lower than I expected. I expected more homes would hit the market as home prices increased. Part of the reason for the low supply is demographics. The Baby Boomers are getting older and older people sell and buy homes less often than younger people. Part of it is that many people who bought homes in Phoenix 2004, 2005, 2006 and 2007 are still underwater! They would have to PAY money to sell their homes. That ain’t gonna happen. All those underwater homes essentially lower supply. Then there are the people who bought at the top who don’t want to sell for less than they paid, even if they do have some equity. They aren’t technically “underwater” but they don’t want to sell for less than they paid. Sales. Strong but not crazy. The real economy is fine even though the stock market has been going more or less sideways for 2 years. The Millennials are finally getting established economically and buying homes after entering the job market during the worse recession since the Great Depression. 2017. The big story will once again be interest rates.